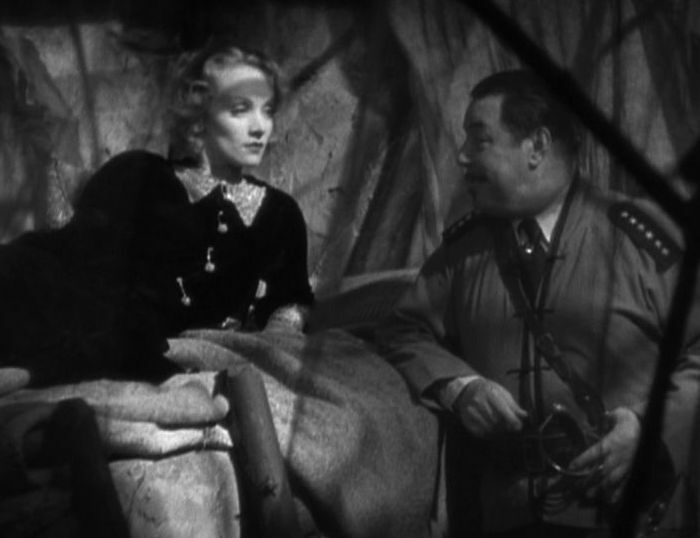 Shanghai Express was the fourth, and one of the best, of the seven outstanding films that Josef von Sternberg made with Marlene Dietrich in the 1930s . 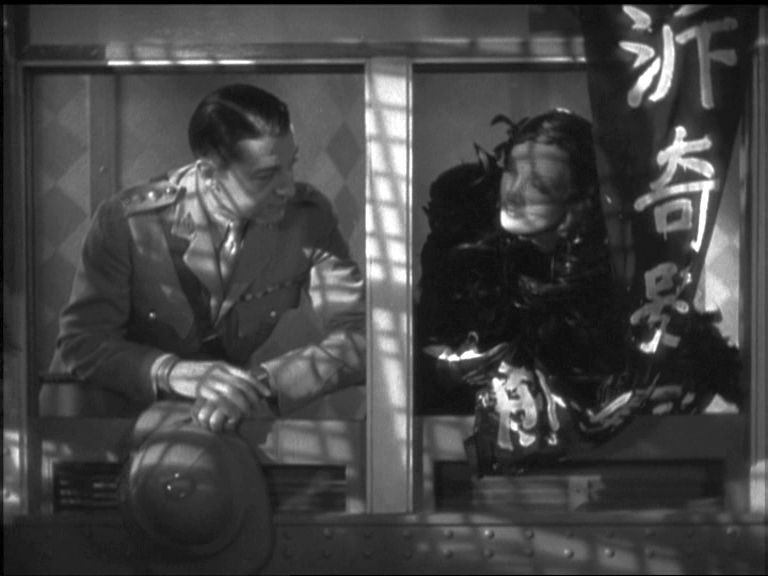 Unlike their preceding film, Dishonored (1931), which had more of a historical/adventure spin to it, Shanghai Express was a return to the moody and deeply romantic style that characterized Morocco (1930). The story follows the fate of a group of mostly European travellers who take the train from Peking (which had recently been renamed, “Beiping”) to Shanghai. This was the “Warlord Period” of 20th century Chinese history, and the Nationalist Government at that time only had tenuous control over various warlords and rebel groups that were operating about the country. Von Sternberg was always a master of cinematography, but this film was perhaps his masterpiece in chiaroscuro and atmospheric lighting. Working in the studio, he again managed to evoke an exotic realm that fires our imagination, even if it may not have perfectly matched the physical reality. Like Wong Kar Wai who came much later, von Sternberg effectively used physical confinement and cramped quarters, often setting his characters behind partially obscuring architectural artifacts in the foreground, to create the crowded, but often lonely, atmosphere of modern urban society. This cinematic style, combined with his stories which featured characters more obsessed about their pasts than their futures, set the parameters that came to make up film noir. Adding to these effects is the fact that this film takes place almost entirely at night and in the middle of a confusing Chinese civil war in which it is difficult to determine who can be trusted. 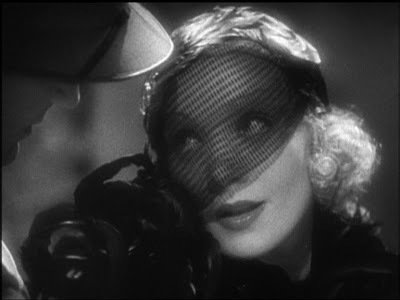 “Shanghai Lilly” (played by Marlene Dietrich), whose name is really Magdalen. She is a “coaster” – a courtesan who travels up and down the east coast of China “living by her wits”, as they say. Captain Donald Harvey (Clive Brook), a medical doctor serving in the British military. Henry Chang, an enigmatic half-Chinese traveller. Hui Fei, another young “coaster”, but of Chinese ethnicity. Sam Salt, a loud, no-nonsense American. Reverend Carmichael, a highly moralistic Christian pastor from England. Eric Baum, an elderly German businessman. Major Lenard (played by Emile Chautard, a long-time French writer, director, and actor) an elderly French military officer. As the train sets out, Harvey recognizes fellow passenger Shanghai Lilly as his former lover, Magdalen, whom he has not seen since he jealously broke off their relationship five years earlier. It is clear that they still have strong, though suppressed, feelings for each other. The issue is Magdalen’s status. Five years earlier she had played the game of trying to make the clearly not-very-demonstrative Harvey jealous, but this ploy had backfired when he had angrily walked out. Disconsolate afterwards and without any purpose to her life, she had taken on many other lovers and had become a “fallen woman”. Now, though she admits her foo lish mistake, Harvey doesn’t believe her. Reflecting on what she may have been doing during their time apart, he says, “I wish you could tell me there had been no other men.”, and she responds by saying, “I wish I could, Doc, but five years is a long time.” This is the abiding character of Marlene Dietrich in all her films: utter unashamed authenticity about who she is. You must take her on her terms. Reverend Carmichael certainly doesn’t take her on any terms. He sternly warns the other passengers in the carriage about the “rotten souls” of the two prostitutes on the train. Harvey, the surgeon and man of science, scoffs at Carmichael’s absurd claims, scornfully questioning how Carmichael could ever have acquired the medical knowledge first to identify the location the soul in the human body and then to ascertain its state of rottenness. The train is soon stopped by government soldiers, and all passengers are forced to leave their carriages and show their documents. One of the Chinese passengers is singled out and arrested. 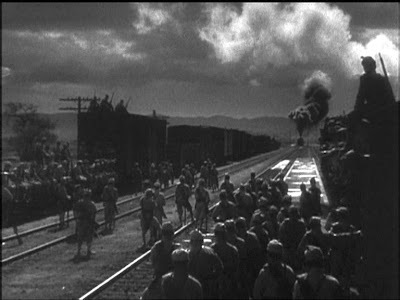 In the commotion Henry Chang goes to a nearby telegraph office and sends a coded message to someone indicating that (a) a top rebel agent has been arrested, (b) that the train must be stopped by rebel forces at an upcoming station, and, by his signed codeword, that (c) he, himself, is the “Number 1" in the rebel warlord organization. In due course, the Shanghai Express is stopped by attacking rebel soldiers, as Chang had ordered, and after many Chinese government soldiers are killed, all the passengers are again ordered to disembark from the train. Chang now reveals himself as the rebel commander that he is, and he begins examining the passengers in order to identify a suitable hostage that he can use to swap with the government in exchange for his own highly valued assistant now in government custody. When he discovers that Harvey is travelling to Shanghai in order to perform critical brain surgery on the governor general there, Chang knows that he has found his man. Another telegram is sent, and the English persuade the Chinese government to agree to make the trade. Meanwhile Magdalen, agitated with worry about what might happen to Harvey, urges Reverend Carmichael to do something. He tells her that the only thing she can do is to pray to God, and when she doubts that God would listen to such a sinner as herself, he assures her that God remains on speaking terms with everybody. So she sneaks off to a darkened train compartment and kneels down in fervent prayer. Later during the waiting for the returned rebel agent, Chang, who has had his eye on both Shanghai Lilly (Magdalen) and Hui Fei, threateningly propositions Lilly, and Harvey intercedes forcefully by punching him. Furious about this loss of face, the ruthless Chang has Harvey bound to a chair and swears to Lilly that he will have Harvey’s eyes gouged out prior to returning him to the government. Distraught upon hearing this, Lilly resolutely decides to sacrifice herself for her love and offers to become Chang’s mistress if he will spare Harvey. Chang accepts the deal and releases Harvey, but Hui Fei, who had earlier been forced to submit to Chang’s sexual demands, stabs and kills the monster when he is not looking. B efore the rebels can react, everybody scrambles to get back on to the train, and it pulls out of the station on the way to Shanghai. Now Magdalen and Harvey are safe, but Harvey knows nothing of Magdalen’s willingness to sacrifice herself for his safety. In his eyes, Magdalen was simply willing to sell herself to another man. And Magdalen never tells him – she never tries to apologise for her past deeds. She offers her love unconditionally and demands the same in return. This is always von Sternberg’s characterisation of true love. Finally, at the Shanghai train station when they appear to be about to separate for the last time, Harvey breaks down and comes over to Magdalen. Confessing his total and unconditional love for her, they finally embrace. The theme of love and faith overcoming all obstacles has rarely been so exquisitely evoked as in Shanghai Express. Von Sternberg has created in the film a dark, Expressionistic journey down into the depths of Hell and back, with love the only saving grace. Everyone you meet may have some secrets, and sometimes you must simply have blind faith in them. In fact several of the passengers on the train turn out to be not what they seem. Chang, of course, turns out not to be a businessman, but a rebel warlord. Major Lenard turns out not really to be a major; he was discharged from the military, but wishes to conceal that fact from his family. Eric Baum turns out not to be a respectable businessman, but a dealer in illegal opium. Hui Fei appears to be submissive, but she is capable of murdering her assailant. Even kindly Mrs. Haggerty tries to sneak her pet dog past the authorities and into her compartment on the train. And Reverend Carmichael finally recognizes and confesses that the women with the supposedly “rotten soul” is actually worth much more than all the others. The acting in the film is generally good, but Eugene Palette’s performance as the American Sam Salt is a bit overbearing. Warner Oland, who convincingly played the loathsome Henry Chang, was actually of Swedish descent, but he made a career out of playing Chinese – he was famous for his role as Charlie Chan during the 1930s. The role of Hui Fei was played by Anna May Wong, who was the first Chinese star in American movies. Gustav von Seyffertitz, who had a major role in Dishonored, here played the role of Eric Baum in his usual emphatic fashion. Clive Brooks, though, is excessively wooden and stiff as Captain Harvey. The British stiff upper-lip tradition is taken to such lengths in his case that one wonders if there is any capacity at all for romantic passion beneath that uniform. Von Sternberg had a much more effective British actor in his next film, Blonde Venus, with Herbert Marshall, who had the right combination of reserve and emotion. Marlene Dietrich, though, makes up for any shortcomings on the parts of the other performances. Dietrich characteristically had the magical persona, as projected by Josef von Sternberg, of always being both direct and demure. She suggests delicacy, but is nevertheless capable of forcefulness. She is authentic, yet she is invariably ironic: she is always composed and resigned to her fate – and there is always a suggestion that there is more to the story than she cares to tell. There are affinities between Dietrich and Chinese actress Gong Li (as directed by Zhang Yimou). Both are physically robust, yet graceful and sensitive. And with both of them, there is the suggestion of strong passion that lurks just below the surface. What makes the film an outstanding experience, though, is not so much the ironies of the characterizations, but the masterful visual expression of the story. It is a characteristic of von Sternberg’s films to portray the action events in elaborately shot, but brief and fast-paced impressionistic sequences, while the “relationship” scenes are lingering, more fully rounded explorations of human interaction. Von Sternberg switches back and forth in this fashion between (a) the exotic and ominous details of the journey, (b) the colorful and distracting prattle of the expatriate wayfarers, and (c) the anguish felt by the former lovers. 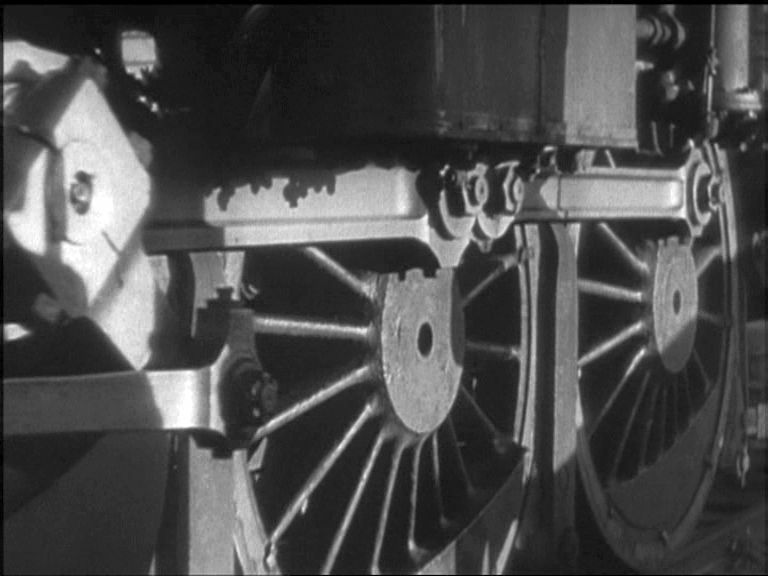 This is all punctuated by the visual and aural motif of the steam-driven train relentlessly chugging towards the dark destiny that awaits them all (an effect that Von Sternberg similarly achieved in Morocco, with the legionnaires’ drumbeat incessantly signalling the dark forces pulling Legionnaire Brown away from Amy Jolly). In Shanghai Express it all comes together – a dark, romantic, expressionistic dream.